Company name: KLP Lovasfelszerelés Kft. Company name: E.N.S. Informatikai és Rendszerintegrációs Zrt. The company KLP Lovasfelszerelés was established in 1988. We are the exclusive hungarian importer of the Tattini, Daslö, Brad Ren's and Natowa products, and the distributor of the Wintec, Bates, Pessoa, Westfield and Liveryman brands. The great Italian Tattini depot, the manufactury founded 150 years ago, is a safe background for us with the equestrian equipment gathered from all over the world, from which we receive truck full of deliveries in every two weeks. We offer very competitive prices for the 1500 products of the Italian company, a growing number of KLP and other quality products and other acclaimed company's merchandise. At the end of 2017 we've moved our store in Budapest a new location. The new location is over 200 m2 in size, where individual customers and resellers are both welcome. We have our whole product range available here, on the usual moderate prices. Our range is very wide, our prices are very good, our customers will find extraordinary riding gear as well as the good quality but cheap priced items. In addition, in March 2015 in the place of our old shop in Kecskemét, we reopened the equestrian outlet store, where huge discounts are awaiting for You from previous collections, but all of the newest products are available as well. For the address and location of our stores with map and description, please follow the link. Furthermore we have a delivery service too, where we ship products from the Tattini catalogue as well as the whole range of our webshop. Payment is available with collect on delivery, wire tranfer, credit card or PayPal. By using the last three, you don't even have to pay any collection fees. Check out the online version of the current Tattini catalogue in English by clicking on the link below. 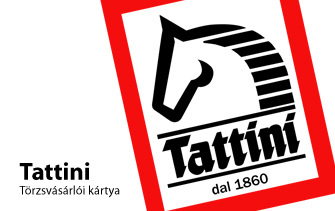 By using the Tattini loyalty card at our partners in Hungary and by ordering from the KLP webshop You are entitled for discounts. If you don't have a Tattini loyalty card, request ony for Yourself at the KLP Lovasfelszerelés stores, at our partners, or in e-mail! The card will be issued for the customer who have a sum of 100 000 HUF per sale (5%) or more than 200 000 HUF of total purchases (10%). Our customers with loyalty cards are eligible for 20% discount (regardless of the card type) from the prices of the Tattini Top Products! For more accepting places inquire on our e-mail address! The discounts above are only applied to the products that are not on sale. The various cards can't be combined, one person can have only one card at a time. All of our returning online customers get a 2% discount for every Tattini manufactured product, that is not on sale at the moment. Customers with over 50 000 Ft of online purchase are eligible for a 5% discount (on Tattini manufactured products) from any further webshop purchases. Customers with over 100 000 Ft of online purchase are eligible for a 10% discount (on Tattini manufactured and 5% discount on other products) from any further webshop purchases. All of the 5 and 10% members of our loyalty program receive a 20% discount on the Tattini Top Products. The discounts above are only applied to the Tattini manufactured products that are not on sale. The various cards can't be combined, one person can have only one card at a time. If You would like to be a reseller of the products KLP is offering, please get in touch with us, either on the contacts on the bottom of this page or by filling out this form. Thank you.